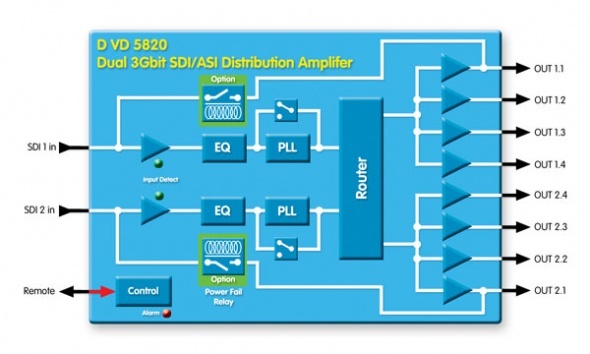 The DVD 5820 can be configured as a single channel 1>8 or dual channel 1>4 SDI distribution amplifier. Each channel can be set to reclocking or non-reclocking mode. This module is ideally suited for demanding digital multi-format broadcast and professional applications. In 1>8 mode either input can be mapped to the 2 banks of 4 outputs. The optional mechanical relay will connect the inputs to one of the outputs in the event of a power failure.